#2826: Does Clinton’s 8(a) Bridge Link A JonBenét Snuff Film To Mentor-Patented Zulu Tor? 1. 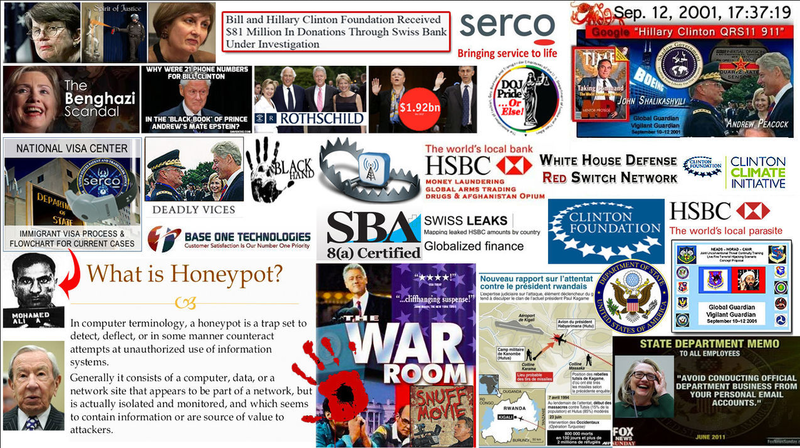 Abel Danger (AD) claims that Hillary Clinton’s aides used Federal Bridge Certification Authority servers installed by SBA 8(a) companies to transmit images of the JonBenét Ramsey snuff-film murder on Christmas Day 1996 over mentor-patented communications devices in Zulu time. 2. AD claims that the snuff-film images were relayed over a Sun Microsystem wireless (US 5371794 A) device to former director of Lockheed Martin Lynne Cheney and were later archived on patented onion router (Tor) servers installed by 8(a) companies in the Pentagon’s U.S. Navy Command Center and the Clinton’s Whitehaven home in Washington, D.C.
3. AD claims that Hillary Clinton lied about her presence in New York on 9/11 when she was allegedly watching the “first live-broadcast mass snuff film in human history” on a mentor-patented Tor server in her Whitehaven home with her 8(a) ethnically-disadvantaged Filipino maid Marina Santos. 4. United States Marine Field McConnell – Global Operations Director of Abel Danger –has offered to serve as a five-star general in a Trump administration to neutralize the mentor-patented Clinton bridge and avenge the snuff-film deaths of JonBenét in 1996 and 71 officers of the NYPD et al in the demolition of the WTC Twin Towers on 9/11. Investigators had sought the gifts, allegedly hidden under Currie’s bed on orders from Clinton, as evidence. The State Department and Clinton campaign did not respond to requests for comment. “Whitehaven was sold to the Clintons by Henderson in 2000 for $2.85 million, below the $3.5 million list price, and had an assessed value, in 2016, of $5.3 million. The purchase of the house by Bill and Hillary Clinton marked the first time a former United States president had owned a property in Washington since Woodrow Wilson. In 2006, Hillary Clinton’s mother, Dorothy Howell Rodham, moved into Whitehaven. — In May, 1991, CalComp offered to exercise its 25% equity option, purchase Access Graphics (its largest distributor), and provide funds for expansion. The deal gave John Ramsey $8 million and ousted Jim Hudson (the partner whose company, CAD Distributors, had been based in Boulder and who presumably was the reason AG was located in Boulder). AG became a wholly-owned subsidiary with its same management and about 120 employees. — In 1993, Access Graphics was separated into a distinct unit. Daniel M. Tellep, Lockheed’s chairman and chief executive officer, said the decision reflected a careful review of CalComp and Access Graphics’ business performance and potential. “Separating out Access Graphics permits us to provide the focus necessary for this rapidly growing and profitable business to realize its substantial potential,” Tellep said. Access Graphics became a stand-alone subsidiary, one of six companies in Lockheed’s electronics systems group; CalComp was another of the six. — Evidently, CalComp was not happy about the separation; William P. Conlin, president, and Larry Sanders, senior vice president of field operations, left CalComp “to pursue other interests.” This left CalComp without any top management; Val P. Peline, Lockheed group president of electronic systems, was appointed interim CalComp president. — Also in 1996, Lockheed Martin acquired Loral Corporation’s defense electronics and systems integration businesses for $9.1 billion (FYI, Loral is the company which, in Feb. 1996, was accused of the illegal transfer of technology to China) and eliminated 1,600 jobs as it looked for savings; the layoffs were announced in November. ..
Access Graphics and the Paughs represented a “second life” for John Ramsey. He met Patsy when he was nearly 40, divorced, unsuccessful. She was 13 years younger, a vivacious 23-year-old Miss America runner-up, full of ambition. Neither of them were truly naive. He’d been in the navy overseas, married for 12 years and had 3 children. She had been through the pageant wringer and was in the world of competitive advertising. Something happened at the end of 1996 that the Ramseys don’t want known. Maybe it didn’t happen in 1996; maybe whatever the secret is happened earlier but the intense investigation after the murder threatens to expose whatever it is. 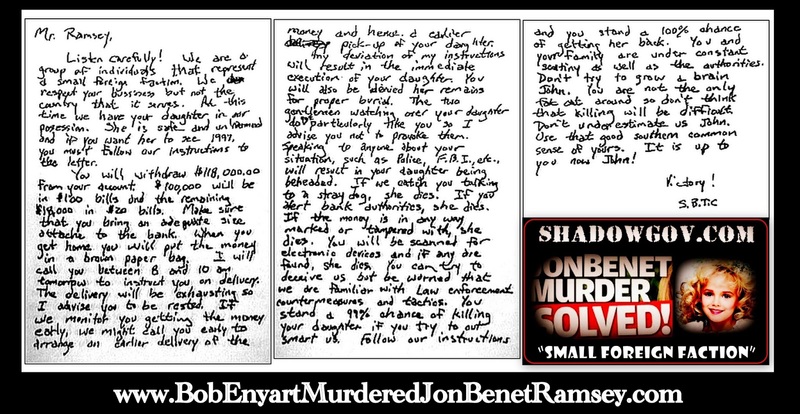 The “ransom document” points a finger at John and his business. Two gentlemen had his daughter in their possession and they didn’t particularly like John; they respect his business but not the country it represents. The document said, essentially, we’re [8(a)] foreigners who know a lot about you and your company; we don’t like you but we want you to be rested and able to follow a complicated series of actions required to give us your bonus amount for that year; we’re watching you and the “authorities” (law enforcement and financial) so don’t try to grow a brain (which implies “they” think John is stupid). If you mess with us, there’s a 1% chance you’ll get your daughter back; don’t mess with us and you will certainly get her back. So what happened? Was his daughter kidnapped, held by two gentlemen? No evidence of that. Was his daughter beheaded, even though he disobeyed orders? No, although a cord was wrapped very tightly around her throat and her skull was nearly split in half. Did he get his daughter back, even though he messed with the gentlemen by disobeying? Yes, he did. She was dead but he got her back and showed her to his close friends and the police. “Tomorrow” and the percentages didn’t seem to matter to John. The threat of close observation didn’t deter him from contacting the police (he has said he told Patsy to call them). He wasn’t worried about the note or the 911 call (he was cordial and joking that morning). He didn’t show any emotion until he “found the body at 11:00” (according to reported statements he made to John Andrew). Then he seemed to be worried, focused on a puzzle. He wandered around, examined his mail, ignored Patsy and the friends gathered around her. Until the detective decided to give him and his two men friends something to keep them busy (her stated intention). Then he sprang into action. Fernie didn’t go along but stayed behind. White followed John into the basement, tagged along while John showed him evidence of an intruder, knelt beside John when he saw the body, then ran off yelling for someone to call 911. John picked up the body and carried it upstairs to the foyer, where the detective told him to set it down. Then he seemed to guide the detective to observe the body, then guided the handling of the body by covering it. Original Assignee: Sun Microsystems, Inc.